^ Wills, Dominic (2008年). “Heath Ledger Biography”. en:Tiscali TV (UK). http://www.tiscali.co.uk/entertainment/film/biographies/heath_ledger_biog.html 2008年4月22日閲覧. "The Ledger name was well-known in Perth, the family having run a foundry that provided much of the raw material for the famous Perth to Kalgoorlie Pipeline ... The Sir Frank Ledger Charitable Trust, named after Heath's great-grandfather, was renowned for granting funds to the area's universities, paying for visiting lecturers and scholarships for gifted students." 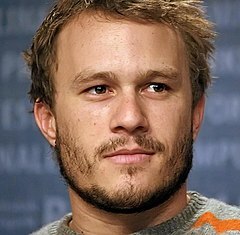 ^ Heath Ledger　Biography Archived 2007年12月16日, at the Wayback Machine. ^ Dan Jolin (January 2008). “Fear Has a Face”. Empire 223: 87–88. http://www.empireonline.com/magazine/covers/image.asp?id=24227&gallery=1365&caption=%23223%20%28January%202008%29 2008年7月8日閲覧。. ^ Dan Jolin (July 2008). “The Dark Knight”. Empire 229: 92–100. http://www.empireonline.com/magazine/covers/image.asp?id=27819&gallery=1365&caption=%23229+%28July+2008%29 2008年8月18日閲覧。. ^ Lipsky, David (March 2006). ローリング・ストーン (Rolling Stone) (996): p. 49.